Here we are on Thursday with Friday Fictioneers, the prompt for which was posted on Wednesday. Confused? Never mind, because it’s story time, hosted as always by Rochelle. 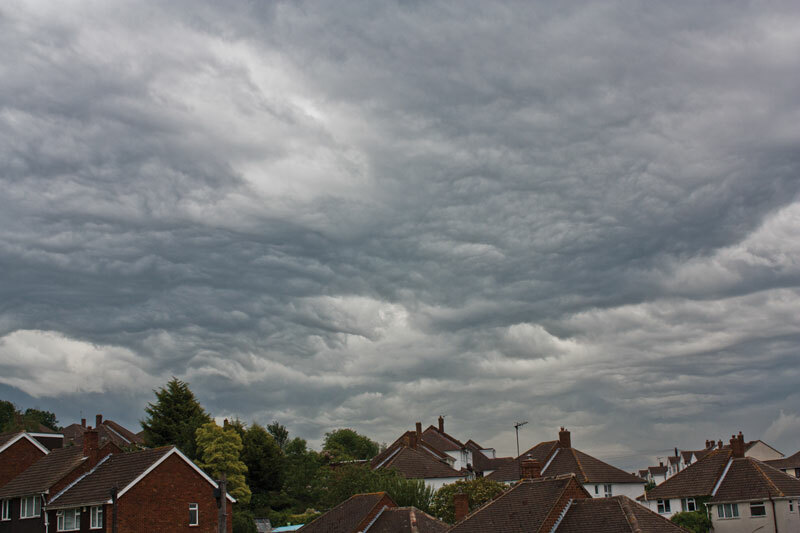 The photo which prompts our 100-ish word story this week was contributed by Kelly Sands and features big clouds over houses. But are they clouds? ARE THEY? Or are they actually Something More Sinister (dum dum dummmm)? My story this week is a bit nuts, so bear with me. The other stories this week can be found by clicking on Bracken, the little blue froggy, below. Here’s the photo of the clouds. OR ARE THEY CLOUDS? etc etc. It came from Outer Space. NASA had pictures and everything. One evening in late May it had appeared over the sleepy hamlet of Little Frimpton. The residents took it in their stride, as country folk often do. In June it broke wind, hospitalising several members of the Little Frimpton Knitting Circle during a particularly complicated crochet demonstration. Gas masks were distributed to the villagers. Yeah, they’re the worst sort of aliens. Give me a good old-fashioned invasion any day. One week it’s like you’re channeling Dario Argento, and the next week it’s Mel Brooks. 🙂 Yeah, I know those are directors, but it’s the first thing that came to mind. Urgh 🙂 If it starts to glow, RUN. You did not just write a fart story! I put it rather more delicately, though I guess “breaking wind by any other name would smell as sour”, as Shakespeare might have said. This is the funniest thing I’ve read in weeks. I couldn’t stop laughing. You got me. LOL. I don’t know if I’ll ever be able to look at the prompt picture the same way again. I’m so glad you enjoyed it! I could see a number of gloomy stories coming from that picture so I thought I’d try for humour instead. Hahaha! First, the character names are hilarious. Guess there’s hillbillies everywhere. I can imagine the crochet club. So funny, doc. It was tentatively set in the rural West Country, hence the accents and names (though I don’t personally know anyone called Jethro, there is a famous Cornish comedian by that name). LOL. Oh my, that was so good. I can just see the farmer in his turnip field with a bit of straw in his mouth while talking to a reporter. I think the villagers are quietly enjoying their moment in the limelight. It was the dog, the dog did it. Or blame aliens? That won’t work. It was aliens! It was! This is so funny, I almost spit my coffee all over the table. Cool, that’s such a great film – I’ve seen it many times! I’ve also seen Sean of the Dead several times – we have the same taste in films and humour I think! I’m so happy you guys liked it. The Incredible Inflatable Flatulent Alien attacks. I love it. I can just see Hollywood calling. I’m waiting by the phone right now for my big break. Douglas Adams beware, Ali’s writing farting alien stories! Hilarious, darling. You have the most British sense of humour since John Cleese himself. Bravo! The fart was made even more clever by the addition of the knitters. So very, very funny and not just a bit nuts – deliciously nuts. I’ve noticed that some of my favourite humour writers (Douglas Adams, Terry Pratchett) also add these little details when something silly happens and have found it works quite well. “Jethro” always says “small village farmer” to me, with a broad West Country (of the UK) accent! Well, now you’ve crossed over into belly laughing writing. I was emotionally ready for the terror and you delivered a amazing humorous story. As a writer you are exempt from PC. Your characters are speaking, not you. Jethro lives on here in the Beverly Hill Billies. The clouds certainly opened up possibilities of terror but I suddenly had this idea instead. I’m glad you enjoyed it! I always worry a bit about stereotypes but sometimes they’re necessary for the story. That’s one of the most warped stories I’ve ever read. Dare I say, “What a gas! ?” Unique and funny. I thought it was time for some humour and ended up with something some would describe as very British, given the subject matter! You really went to the out house for this one. Really funny. ;0) What fun. Glad I don’t live there. But you gaga wonder what alien changes there’ll be to the soil, plant life, and to them that eats it all. Maybe it’s a slow poisoning via the food chain until the aliens are free to move in. Oh good, I was hoping someone would write an alien theme. Really thinking outside the box, too, with it upsetting the knitting circle. Will they ever knit again or are their minds blown?! Ha ha. Great story. I believe they’ve quit knitting and started a gardening club.